This shimano bottom bracket simply works, and looks great. Even comes pre-greased at the bearing interface, ready for you to install your crankset. I had similar issues with the tool adapter, specifically using it with the park tool BB total. it was a tight fit tool-to-tool, but it works. In contrast to other review, I was able to get it plenty tight by being careful. I replaced my old Ultegra bottom bracket with this new 6800 version. There was substantial engineering effort put into this to decrease the drag from the seals. It's noticeably smoother and easier to pedal. Do note that Shimano now has three different sizes of bottom brackets so you'll need the right tool for each. DA 9000 is the smallest in diameter, then Ultegra then 105 and none of them are the same size as the old outer diameter. 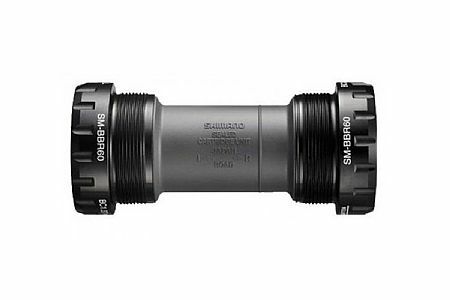 Shimano includes a plastic adaptor with each bottom bracket to fit the old size Shimano tools (from Park or others). However, when you try and torque it down to the required 35nm or so, it's very easy to strip the plastic adaptor. Plan on getting the right tool ASAP. For this bottom bracket the right tool from Park Tool is the BBT-59. Anyhow, this is a great deal in a BB in terms of cost and performance. replaced the worn out bottom bracket on my Felt. Price was great and it was shipped in a timely manner. Not a Chris King, but for the price, does what is should. BBT-59 is the installation tool to use. Shimano's included tool strips out before the BB is torqued properly.